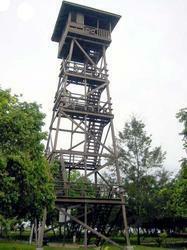 Leading Manufacturer of watch tower from Ludhiana. By focusing on variegated demands of our respected clients spread all over the country, we are offering Watch Tower. Offered watch tower is precisely developed by using quality assured components and sophisticated technology in fulfillment of industry standards. Our watch tower is tested on numerous parameters so as to deliver a defect free range. Also, we offer this watch tower in various specifications as per precise requirements of our customers.